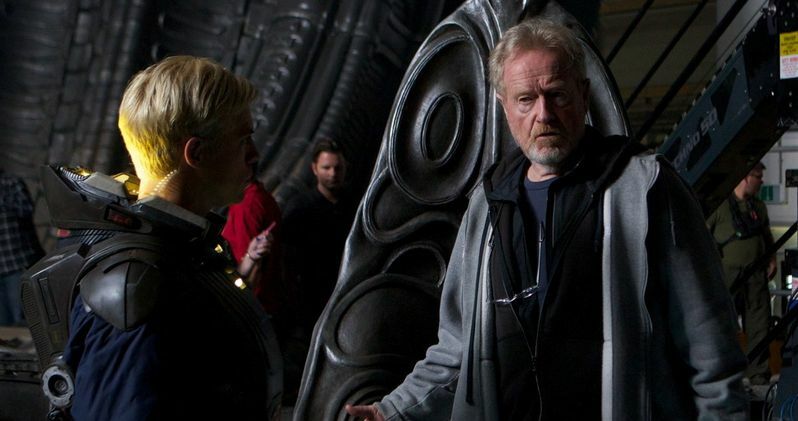 Ridley Scott is busier than ever, and there has been some speculation as to whether or not he would revisit the world of Blade Runner or Alien first. As suspected, the prolific filmmaker has confirmed that Prometheus 2, a sequel to his 2012 Alien prequel Prometheus, will be his next movie as a director. He has The Martian coming out this October, but as soon as it was wrapped, he didn't hesitate to jump into preproduction on this upcoming sci-fi thriller. Prometheus originated as a prologue to the action seen in Ridley Scott's 1979 horror classic Alien. But the movie morphed into something much greater than a mere prequel, becoming its own thing and igniting a new franchise for 20th Century Fox. It took some pretty complicated ideas head-on and in turn tore audiences in two. Some longtime fans loved it, others hated it, but there is no denying it is interesting. And it did leave off with one heck of a cliffhanger, which is the starting point for Prometheus 2. Noomi Rapace and Michael Fassbender, the only two surviving characters from Prometheus, are confirmed to return. Since Prometheus first hit theaters, Ridley Scott has gone onto direct three more feature films, including 2013's The Counselor starring Michael Fassbender, Javier Bardem, Cameron Diaz and Penélope Cruz, the less-than-well-recieved Exodus: Gods and Kings starring Christian Bale and Joel Edgerton, and this fall's The Martian starring Matt Damon. He's also done a few TV projects in that time. But nothing is more anticipated than Prometheus 2 and Blade Runner 2, though he's no longer directing that second project, with Denis Villeneuve said to be taking the helm. Of course, that could change. As previously reported, it sounds as though Prometheus 2 will indeed begin shooting in the first half of 2016. Empire Magazine recent caught up with Matt Damon and Ridley Scott to talk about the The Martian. It is here where it is revealed how quickly Ridley Scott jumped into working on the sequel following completion of The Martian. Matt Damon says his director was done with the movie about two weeks after they shot it. Says Ridley Scott. "I was starting to look for locations for my next movie, which is Prometheus 2." Prometheus ended with Noomi Rapace's scientist Elizabeth Shaw and her android David, played by Michael Fassbender, badly injured and damaged, yet still eager to fly off and locate the home world of the Engineers, who are possibly responsible for all of humanity. Shaw hopes to discover who the Engineers are, and why they attempted to wipe out life on earth. Prometheus 2 will utilize real-world shooting locations to bring the Engineers home world to life, which will likely be combined with quite a bit of sound stage work as it was in the first movie. Jake Paglen, who is best known for his work on Transcendence, took over screenwriting duties on the Prometheus sequel from Damon Lindelof, who wrote the first movie. Since then, Michael Green, who contributed to the 2011 Green Lantern script, has come in for rewrites. It is suspected that they will further connect the world of Prometheus to the world of the original Alien movies. Alien 5 is in the rely stages of production at 20th Century Fox, with Neill Blomkamp directing. It was reported earlier this month that Prometheus 2 will actually delay work on Alien 5, and with Ridley Scott already deep into pre-production on his sequel, it sounds like that is the reality. Prometheus 2 will hit theaters in 2017, while it's expected that Alien 5 will get a 2018 release date. Its possible that both films will benefit each other in the long run.